Not surprisingly, the top 10 in the latest rankings are: Sweden, Denmark, Netherlands, UK, Switzerland, Germany, Finland, France, Austria and Canada – the high resourced and low population countries, which have done all they can to ensure the best quality of life for their own people, and can now afford to look elsewhere and do some good at the global level. 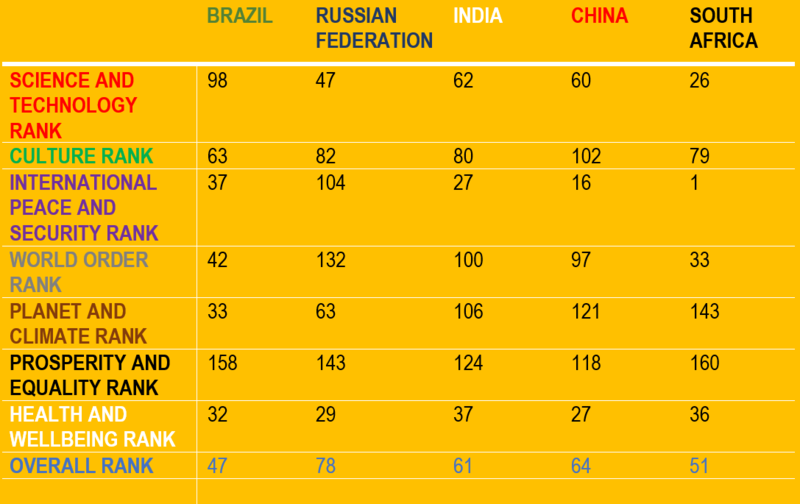 Firstly, it’s a pleasant surprise that all BRICS countries are in the upper half of global Good Country rankings but that Brazil fares the best and Russia the worst, is rather surprising. Another encouraging fact is that BRICS as a whole is doing reasonably well in the health and well-being sector globally, even when their domestic health services are often downright abysmal and inequitable. But that’s the way the indicator is designed. For instance, Indian pharmaceutical companies have fought restrictive trade practices to reverse engineer several life-saving drugs, making them available cheaply for the worst affected areas, as in the case of HIV drugs in Africa. That South Africa ranks as the number one contributor to international peace and security is indeed a matter of pride, and China, India and Brazil all do well in this regard. Russia is again the odd man out – but being the world’s second largest arms exporter, that is hardly surprising! The fact that Brazil has at last got its environmental act together is a relief for the whole planet, but the world’s most polluted cities and reckless mining continue to give India, China and South Africa low rankings on this count. Finally, the saddest performance of BRICS as a whole is in their failure to eradicate (or even reduce) poverty among their citizens, and narrow the growing divide between rich and poor – BRICS has among the highest Gini Coefficients of any group of countries. This makes them net consumers, rather than contributors of development aid and brings down their ranking (with Russia as an exception in this instance). Globalisation is inescapable and has both negative and positive fallouts: who would have believed that a blog, essentially on governance and development in India, would be read in 111 countries within a year of its inception? But that’s global connectivity for you. So why not a new paradigm of governance based upon global participation, global accountability and global responsibility? Next Post Inclusive Cities – But who pays?